Genesis Breyer P-Orridge and Psychic TV Performing March 4 in Brooklyn – Zero Equals Two! 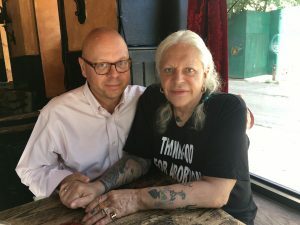 Because of chronic health issues, Genesis Breyer P-Orridge is not likely to do extensive touring with PsychicTV/PTV3 any time soon. However it appears that s/he will undertake the occasional performance in her hometown of NYC with one coming up soon, opening for Cold Cave, sharing the bill with them, Adlt and VOWWS March 4 at Brooklyn Steel, which indeed is located in Brooklyn.